Yesterday was only a shortish drive of about 200km but for some reason after arriving, setting up and doing some food shopping in Alice Springs I was so tired I couldn't even be bothered turning my computer on. The caravan park we are staying in is very nice but really crowded. It's nice staying in the out of the way sites where there aren't people surrounding you. Although I must say my neighbours are very friendly. Today was pretty laid back. We had to get a few things for the van and just had a look around town. Alice Springs is nothing I had imagined, for some reason I thought being in Central Australia it would be very flat red dirt. 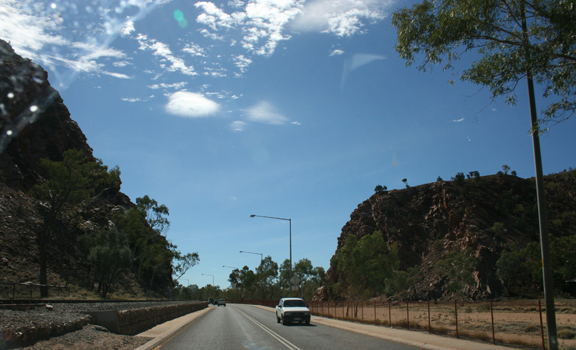 But it is actually situated in the Mac Donnell Ranges, with two imposing rocky hills greeting you as you enter the city. 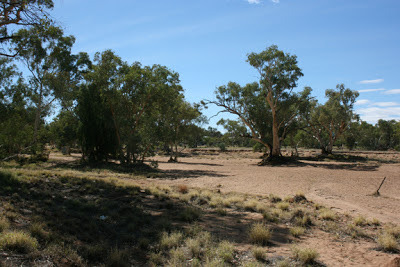 It is also situated on the Todd river, funny thing is the river is usually dry. 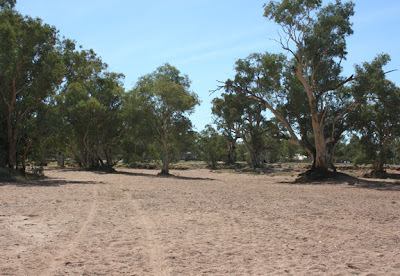 Its pretty wide so I am thinking in the wet season it would get pretty full. It was funny yesterday when we first saw the dry river, there were a few locals sitting down by the river enjoying themselves. I thought of us sitting by the Yarra in Melbourne enjoying the water views. Not quite the same without water!! Back at the camp the lady in the caravan beside us had some craft items she had made out for sale, so seeing I had bought along some of the jewellery I've made I thought I would put it out. I didn't expect to sell anything but at least it got me doing what I intended. But low and behold within half an hour I had sold one of my bracelets. I was pretty chuffed I must say. Standing in the middle of the Todd River!! 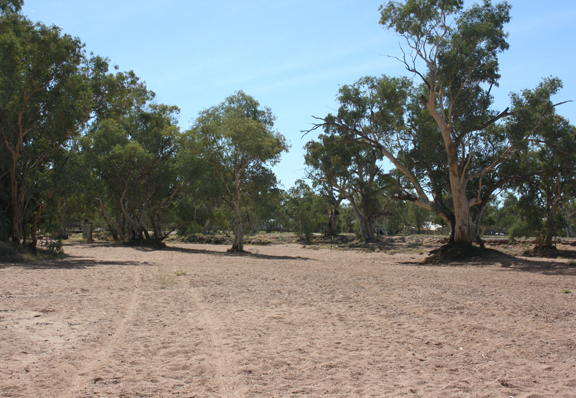 Todd River - find a local to tell you all about the amount of water beneath the sands - I loved my trip to Alice Springs a few years back - one of my favourite places in Australia - Desert Park is amazing. Alice Springs.....this rings a bell for me. I think there was a movie a few years back about a woman losing her baby to a dingo, maybe? I don't know. Sounds like an interesting place Davine.....I can picture those people sitting down by the river and NO WATER!! lol H-m-m-m.
Good idea to put out your jewelry.